The 2019 UPCA National Pipe Smoking Contest will be using Amorelli bulldog pipes and Stokkebye Natural Cavendish Tobacco. The results of the 2013 pipe club census is available as a .pdf file. Consider making a Facebook group page for your club. Several clubs already have one. It has several benefits. First of all it is free! Second, many people use Facebook already. So it would not require much effort to create a page. 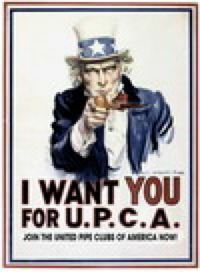 The UPCA National Pipe Smoking Contest was held on May 6th 2018 at the Chicagoland Pipe Show. Photos and contest results are posted here. Official Results from the 2017 UPCA National Pipe Smoking Contest are now available, including individual and team times. A 2013 article in Forbes Magazine. Results of a survey of pipe smokers conducted on Facebook by Doc Garr. In the summer 2012 issue of Pipes and Tobaccos Magazine, William Serad in his article "Emerging flavors" writes about the benefits of slow pipe smoking. What Do Frosty the Snowman, Popeye, Einstein, and These Guys Have in Common? Kevin and Bob at PipesMagazine.com have become big supporters of pipe clubs. The on-line magazine also attracts many younger pipe smokers, so it is a good medium to get the word out about pipe clubs.